Photographs of Germany before WW2 show an beautiful and historic country. There were hundreds of cities that would stand comparison with those of France and Italy. By the time the allied bombing had finished there were only a handful that weren't in ruins. As bad as the physical damage was the destruction of German as the main language of much of Eastern Europe. 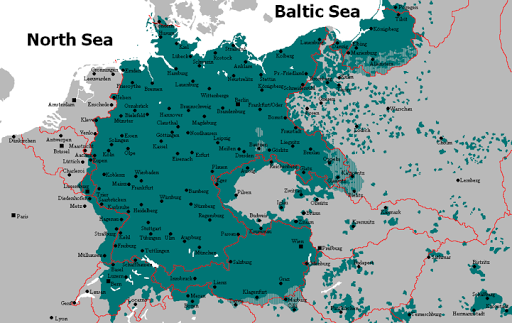 There were the German provinces that were simply annexed into Poland - East Prussia, Pomerania and Silesia - with their populations simply deported into the truncated and divided German state. They were replaced by Poles who were themselves deported from the eastern side of Poland that had become Belarus. And then there were the minority German populations that had caused such a problem before the war, like the Sudeten Germans of Czechslovakia. But there were also German speaking enclaves all over Europe - with some, the Volga Deutche who had lived in the heart of Russia since the time of Catherine the Great. This map shows what that world looked - or rather sounded like. Now, apart from a handful of Saxons in Romania, nothing of it remains. It was the biggest ethnic cleansing that Europe has ever seen - but virtually unknown today in the west. How ironic that the most poisonous nationalist in history should leave this legacy.